The church is built of boulders with stone dressing (Roche Abbey stone) and is situated, at least in part within a round walled site. The church has evidence of Saxon foundations, indicating another church of some type predating the existing one. There is a chancel, an aisled and clerestoried nave, south porch and a western tower with three bells, the largest weighing approximately one ton, as reportedly coming from Ravenser when the chapel there was demolished. In origin it is circa 12th century building (the south east corner of nave). The arcade on the south side of the nave belongs to the early part of the 13th century, and consists of four Early Pointed arches springing from columns alternately cylindrical and clustered with moulded capitals. The south wall of this aisle was rebuilt about 1450, about which time also the clerestory was added to the nave, and the former roof of high pitch flattened. The chancel is spacious, and contains an ancient 14th century piscina. The east window is a very fine perpendicular one of five lights. On the north side of the chancel was a chantry chapel, the doorway of which is still visible in the chancel. It has medieval decoration comprising broken chevrons or a baton pattern on the arches and a just-discernible head on the east respond. The mouldings are keeled and the sunken hollows are very rounded and deep, the mouldings on the porch at Conisbrough Church might be compared to the north doorway at Easington, but even so this at Easington seems more 'advanced'. There is a small nailhead on the north door which is sharp and confident, compared to earlier usage at the Church at Reighton. The tower is built of Roche Abbey stone, and is apparently 14th century work. The chancel was completely restored and re-roofed in 1863, and in 1890 the nave and aisles were partially restored, at an expense of £500. A new open timbered roof of pitchpine was placed on the former, and all the windows of the latter were restored and glazed in heavy tinted cathedral glass. The scheme of restoration has been only partially carried out; there remain yet to be done the roofing of the north aisle and the Ladye Chapel on the south side of the chancel, the clerestory, re-flooring, and several minor details. It is also contemplated re-opening the entrance through the fine north doorway. The "fantastic gallery," erected at the west end of the church in 1802, "in the most debased style of village architecture," which partly concealed the noble arch of the tower, and obstructed the view of the west window, has been removed. This window is a very handsome one of three lights, filled with stained glass, representing Faith, Hope and Charity. It was inserted at the expense of William Henry Mabb and Isabel Herbert, in memory of their relatives. The registers date from 1590, and the communion plate (silver) bears the date of 1571. The piscina stands loose in the south east corner of the chancel. According to the Church Guide, this piece was discovered embedded in the wall over the east window during restorations in 1863; it dates it as 'undoubtedly EE'. It may be Transitional. The piscina has a square plan at the top. The basin has four triangular sides leading to a central hole. From a side view, the usual convention of an imitation pillar is followed, in this case in a restrained late 12th century form with shallow relief. There is a square plinth, perhaps with curved corners, but they may be damaged. Above that is a two-stage, sleek-collared, understated ring. There is a continuous rounded ring. There is a cluster of four shafts below four single scallop capitals, attenuated like the bases. The elongation of the capitals may be due to function rather than style and the base rings resemble mid-century forms. The exit hole for the drainage is just below the ring of the capitals in the middle of one side. It is not regularly cut. There is no rebate at the top, but probably the bowl and the drainage hole would have been lead-lined, as was the case at Adel. The earliest records of “All Saints Church” indicates that the church existed in 1115 when it was a gift to Aumale Abbey (History of Easington). The English estates of Aumale abbey were superintended by (Birstall) Burstwick Priory, the north doorway is said to have been brought on the dissolution of that priory. The churchyard was closed for burials in 1883. It is impossible to give a figure on the total number of burials that have taken place during this period, as there are no records until the mid 1600s but between 1813 and 1883 records show a total of 1003 burials had taken place. This included 35 sailors or unknown persons and 393 infants/children. The churchyard has in addition links with other towns/villages in the area. An unknown number of bodies were re-interred in the churchyard after the destruction of Ravenser Odd, the port situated to the south east of Spurn Point. This was a town of some importance having a Royal charter, its own market and annual fair, a town mayor and customs officers. It also had a court, a prison and a chapel. The town became threatened by the sea in the 1340s, and finally engulfed by the sea between 1349 and 1360. The sea destroyed the foundations of the chapel dedicated to the Blessed Virgin Mary, so consequently many bodies were exposed and brought to Easington for reburial. A similar situation occurred at Kilnsea, in the early 19th century. The sea constantly eroding the cliff had reached parts of the old village and it succumbed to the sea. The 12th century church at Kilnsea (dedicated to St.Helen) had begun to fall into the sea by 1824. By 1826 most of the church had gone and the tower finally went in 1831. The last burial to take place in the churchyard was 2 April 1826, some of the unearthed remains were gathered up and interred at Easington. Burials for the inhabitants of Kilnsea and Spurn continued at Easington until 1864 when a new church (also St.Helen's) had been constructed. The first burial to take place in the new churchyard was 11 July 1865. In total 110 burials took place at Easington between 1826 and 1864 of both Kilnsea residents and those of Spurn Point, in addition to those “Who were cast upon the shore” as the burial register describes those who were unknown sailors who had perished at sea. Situated in Seaside Road HU12 0TY, this Church was built in 1850 and subsequently restored in 1901. 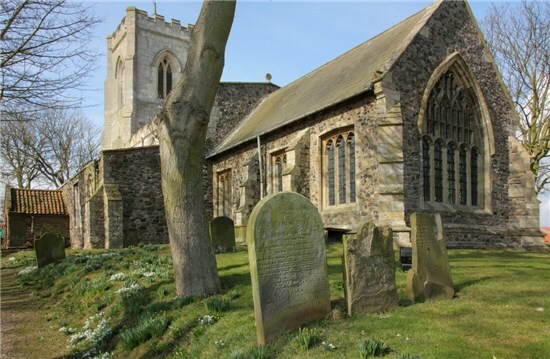 It is one of fourteen churches in the South Holderness Methodist Circuit (SHMC) and has services on the first Sunday of each month commencing at 9.30am. The minister if Deacon Judith Ireland and the church is linked with Patrington on the SHMC website.